The Government of India has finally implemented the decision of increasing the maximum sum limit assured under insurance scheme of retirement fund body Employee Provident Fund Organisation, popularly termed as EPFO, to 6 lakh rupees. This would almost double the maximum sum for its 4 crore subscribers. The decision was, however, taken long back in September by the apex decision-making body Central Board of Trustees (CBT) of EPFO. The decision was to increase the benefits from 3.6 lakh rupees to 6 lakh rupees under the Employees’ Deposit Linked Insurance (EDLI). But the decision was not enforced by the Labour Ministry of India, as the decision was stuck with the Indian Lay Ministry for getting an approval. In addition to the Basic Pay fixed by the Administration of Daman & Diu in respect of all the scheduled employments under the Minimum Wages Act, 1948 vide notification No.LE/LI/DMN/MWA-3(II)/2015-16/81 dated 29.05.2015, the daily rate of Variable Dearness Allowance (VDA) payable on the cost of living index number is increased at the rate of L 9.50/- with effect from 01.04.2016. Under the scheme of deduction of tax at source as provided in the Act, every person responsible for payment of any specified sum to any person is required to deduct tax at source at the prescribed rate and deposit it with the Central Government within specified time. However, no deduction is required to be made if the payments do not exceed prescribed threshold limit. In order to rationalise the rates and base for TDS provisions, the existing threshold limit for deduction of tax at source and the rates of deduction of tax at source are proposed to be revised as mentioned in table 3 and table 4 respectively. The following provisions which are not in operation are proposed to be omitted as detailed in Table 5. Many employees forget to transfer the balance from their previous provident fund (PF) accounts when they change jobs. Some of them even withdraw the money from PF account. Since PF is meant for one's retirement years, financial experts suggest that the accumulated savings should not be withdrawn during one's working years. To encourage employees consolidate multiple accounts, Employees' Provident Fund Organisation (EPFO) has launched a special drive called "One Employee-One EPF Account"
EPFO has set up a special portal for the "One Employee-One EPF Account" drive. Under this drive EPFO will actively help those who want to transfer the balance from their past PF accounts to current PF account which is linked to universal account number (UAN). You need to enter your activated UAN along with your current UAN-linked PF number and mobile number registered with the EPFO. Then you will be asked to enter the details of your past PF numbers that you want to be transferred to your current PF account. Up to 10 past PF numbers can be added under this facility. The numbers provided by you are sent to EPFO offices in which your past PF money was deposited. The offices will in turn get in touch with the employers. After the employer verifies the PF claim, the transfer will be done. The EPFO regional office will get in touch with you in case you face any problem after filing PF balance transfer request. Although the facility to transfer PF balance online existed earlier, it could be used if the details of the previous PF accounts are available in the EPFO database and the employers have digital signatures. The retirement fund body has been advising subscribers to link all their PF account numbers with the Universal Account Number (UAN). With the enactment of the Aadhaar Act, 2016, EPFO is seeking to make Aadhaar the primary identifier for consolidating PF accounts. The UAN was launched in October 2014 to enable members have continuity in their PF membership on change in jobs. The UAN remains portable throughout the lifetime of an employee. All active subscribers have been allotted a UAN which needs to be linked to AAdhar, PAN and bank account. Employee contributes 12 per cent of basic salary to PF. The employer too has to contribute the same amount towards Employees' Provident Fund as its share. A member may opt to continue contributions under EPS till the age of 60 years if the employment is continued. Earlier the contribution was stopped at the age of 58 years. An eligible member may also opt to defer the date of drawing the pension benefit beyond 58 years but not beyond 60 years of age. In such case, the amount of pension will be increased at the rate of 4 per cent for every completed year after the age of 58 years but not beyond 60 years of age. In the event of the death of a member, who opted for deferring the age of drawing the pension, the family of the member would be entitled to pension from the date following the date of death of the member as if the member monthly pension had started on the date of death of the member..
Fund Organisation to implement the new changes in EPS. Greeting workers on International Workers Day with the. Sh. Bandaru Dattatreya, the Union Minister for Labour & Employment (Independent Charge) launched a special Mission consolidation drive “One Employee-One EPF Account” for members of the EPFO. Sh. Bandaru Dattatreya, on the occasion stated that in the recent past, EPFO has taken several IT based initiatives to provide convenient and efficient services to its stakeholders. The initiative of launching the Mission consolidation “One Member One EPF Account” is a step towards encouraging EPF members to access enhanced IT enabled services through UAN accounts that are linked with Aadhaar. Sh. Dattatreya also informed this drive, would result in EPF members having just one EPF account and multiple conveniences. The Universal Account Number that is Aadhar seeded will consolidate multiple past service accounts, across various spells of employment during working life of an EPF member. Sh. Shankar Aggarwal, Secretary (Labour & Employment) elaborated that the EPF member would be requested to provide all his earlier EPF accounts along with his UAN linked account, Member ID and registered Mobile Number. And EPFO would facilitate the transfer of all these accounts into his present account. Instructions have been issued to establishments that in case any new employee joins an establishment, they may furnish, UAN, if any, allotted to the member earlier, or declare that s/he is becoming a PF member for the first time. To educate workers and strengthen the cause of social security, EPFO today launches a special drive to encourage EPF members to consolidate their multiple accounts. The members whose accounts are scattered face many inconveniences such as approaching multiple employers located at multiple locations for settlement of claims. They also face the inconvenience of keeping record of multiple scheme certificates issued in the process. To know about the updated EPF balances, they need to approach multiple offices. With consolidation, a member can have complete control of his EPF account apart from accessing variety of IT enabled services such as email/sms alerts, access to e-pass book etc. EPFO has been advising members to link all their PF account numbers with the UAN and to also seed KYC data against their UAN number. Aadhaar has been uploaded against 1.30 crore UAN, out of which 1.03 crore Aadhaar have been digitally authenticated by the establishments. The establishments are advised to upload and then digitally authenticate the KYC information. KYC primarily means Aadhaar, PAN and Bank Account. With the enactment of Aadhaar Act, 2016 (26thMarch 2016), EPFO is now seeking to make Aadhaar, the primary identifier. Members having Aadhaarseeded UAN, saves the inconvenience of claims forms attestation by the employers. Explaining the benefits of integration of members’ multiple PF accounts Dr. Joy said that consolidated accounts enable continuance of lifelong PF membership, and allow PF, pension and insurance benefits on combined service. Today, large number of members are unaware of Pension benefits that can come through consolidation, defeating the very soul of the EPF legislation. EPFO therefore seeks to encourage members to continue their PF membership by offering increasingly better services and ease of convenience. Larger aim is to help members to upgrade their quantum and variety of benefits being offered by EPFO. · A software has been launched today for centralized processing that will transfer and consolidate accounts with ease. · A member has to provide his current activated UAN along with the current member ID & Mobile number registered at UAN Member portal. 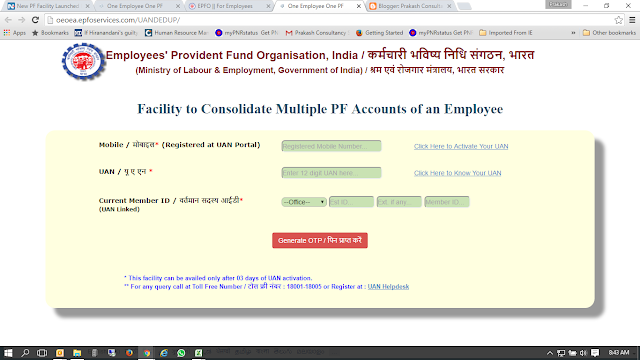 · On validating these credentials, EPFO will facilitate the member to register his/her as many as 10 earlier EPF accounts. · The earlier PF member IDs provided by members will be forwarded to EPFO field office to which earlier member ID pertains. The information provided to field offices will also include current member ID & Mobile number of the member, so that the members can be contacted and facilitated to consolidate his previous EPF Accounts to the Current EPF Account. · Wide publicity will be given to make use of “Inoperative Help Desk” that helps an EPF member to integrate/ settle such accounts. · An electronic de-duplication process to be carried out by EPFO. · “EPFO-E-samkisha” software that is launched to be used for monitoring and implementation of the programme. · EPFO e-Samiksha is a real time, online system for follow-up action on the decisions taken. · The follow up action will be required to be updated by the offices continuously and the status can be viewed centrally. · Business divisions and the field offices can securely access the system through a log-in/password. · This system can also be configured to review the follow up actions in respect of other meetings, if require.